Of course you do and with this inflatable made by Gemmy not only is it super easy but it is an absolute stunner!! Towering at an impressive 12 FEET TALL this inflatable will be the showpiece of your Christmas Yard Display! You will not find an Olaf of this size in any store!! This amazing 12ft inflatable has a couple of unique features that include a fun snowflake Kaleidoscope show and plays an instrumental MUSIC version of "Do You Want To Build a Snowman"! Comes with a small, but powerful blower to inflate the Airblown and keep it inflated. Internal lights create a glowing night-time display. Tough light-weight nylon is weatherproof and fade-resistant. Stakes and tethers, Spare bulb & fuse and complete instructions are included. Blue and Whilte Kaleidoscope Lighting. DID I MENTION THIS IS A GIANT 12 FOOT INFLATABLE THAT PLAYS MUSIC AND FEATURES AN AWESOME SNOWFLAKE KALEIDESCOPE LIGHT SHOW! Be the envy of your neighborhood with this awesome showstopping display piece! Built to last for many years!! Get and install before Christmas! 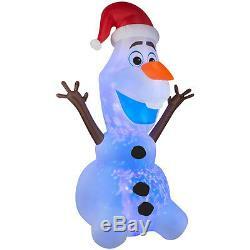 The item "HUGE 12 FOOT OLAF INFLATABLE DISNEY FROZEN CHRISTMAS AIRBLOWN LIGHT UP RARE 12FT" is in sale since Sunday, April 23, 2017. This item is in the category "Collectibles\Holiday & Seasonal\Christmas\ Current (1991-Now)\Yard Décor". The seller is "lizsnation76017" and is located in Newnan, Georgia. This item can be shipped to United States, Canada, United Kingdom, Denmark, Romania, Slovakia, Bulgaria, Czech republic, Finland, Hungary, Latvia, Lithuania, Malta, Estonia, Australia, Greece, Portugal, Cyprus, Slovenia, Japan, China, Sweden, South Korea, Indonesia, Taiwan, South africa, Thailand, Belgium, France, Hong Kong, Ireland, Netherlands, Poland, Spain, Italy, Germany, Austria, Russian federation, Israel, Mexico, New Zealand, Philippines, Singapore, Switzerland, Norway, Saudi arabia, Ukraine, United arab emirates, Qatar, Kuwait, Bahrain, Croatia, Malaysia, Brazil, Chile, Colombia, Costa rica, Panama, Trinidad and tobago, Guatemala, Honduras, Jamaica, Antigua and barbuda, Aruba, Belize, Dominica, Grenada, Saint kitts and nevis, Saint lucia, Montserrat, Turks and caicos islands, Barbados, Bangladesh, Bermuda, Brunei darussalam, Bolivia, Ecuador, Egypt, French guiana, Guernsey, Gibraltar, Guadeloupe, Iceland, Jersey, Jordan, Cambodia, Cayman islands, Liechtenstein, Sri lanka, Luxembourg, Monaco, Macao, Martinique, Maldives, Nicaragua, Oman, Peru, Pakistan, Paraguay, Reunion.